My play of the day. Saccing the sap provided by Fungal Infection for the first and Llanawar for the second and the win. ^Reminds me of one game I had yesterday, opponent went Forest Llanowar Elves into Memory of Folly + 2 Llanowar Elves into T3 Carnage Tyrant on the play. I had perfect curve of Adanto Vanguard into History, conceded anyway. I met damn near the same thing the other day. I've had some 3 bugs by T2, T3 The Immortal Sun lines that play out the same way. Sometimes it's the little joys in life. I just Cancelled a Tormenting Voice. Just played against T1 Fountain of Renewal T2 Ajani's Pridemate T3 Daybreak Chaplain T4 Ajani's Pridemate in M19 draft. M19 draft, opponent has three creatures in play and I figured I'd kill them all with Declare Dominance. It was a sound plan, except the creature I cast it on was Bristling Boar. I actually considered that and figured the Declare Dominance would override Bristling Boar's reverse menace effect. As it turns out, it doesn't; in fact I think my opponent even had the choice of which creature to sacrifice to the Boar. RIP. Guess I learned something new today! Weird. I also would assume Declare gives a replacement effect on the Boar. 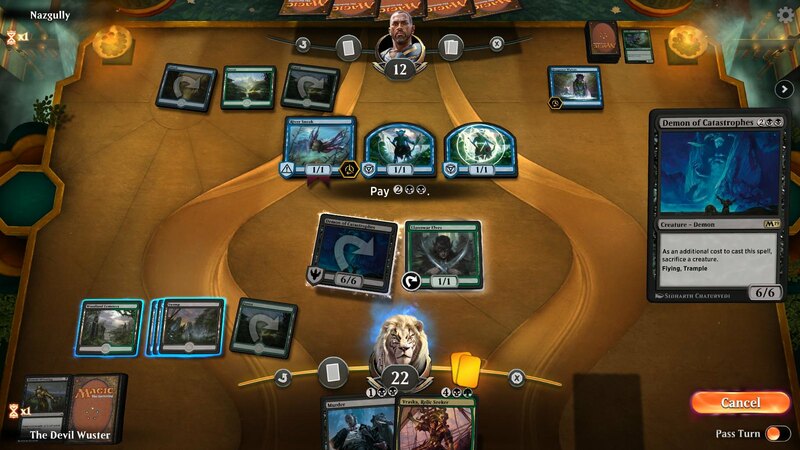 Indeed, according to this: http://www.cranialinsertion.com/article/2713 Bristling Boar can still only be blocked by one creature, and opponent gets to choose, so MTGA's implementation is correct. T4: him land go, me land attack go. Sorry, no Shalai for you to counter! T5: him land Duress taking my Conclave Tribunal, go. Me land attack go. Sorry, no Trostani for you to counter either! T6: him land go, me land attack go. He's down to 6 life. T7: him out of time, Ritual of Soot, then Discovery. I topdeck Karn and play it. Shortly afterwards Karn finds Carnage Tyrant and he concedes. Yeah not getting Shalai or Trostani didn't turn out to do anything - I didn't have to play either - but he didn't get to surveil with Sinister Sabotage, I could've played either safely after his Ritual of Soot, and I still had plenty of gas after his sweeper. Very happy with how I played this game, and kudos to Emmara the one-woman army! Declare Dominance says that all creatures able to block must do so. Only one creature is able to block. Just won a game where, in 16 cards, I drew 12 lands. Two sweepers and Karn repeatedly drawing (swamp/swamp) to dig me. I'm half-way through the Dominaria draft, and just had the pleause to kill a kicked Stronghold Confessor, a Danitha Capashen and do 15 points of damage to my opponent, for the instawin, with a single spell, in my most awesome play ever in Arena till the moment. Felt damn good. Can anybody figure out how? Last edited by callmemaggit on Sun Dec 09, 2018 4:01 am, edited 1 time in total. The Mirari Conjecture with kicked Fight with Fire? Draft. I am wounded and hellbent, but I have a 3/4 flyer and a nice board, opponent is low on life too but has Thallid Omnivire, 4 sapros, and 2 cards in hand. Battle is far from over. Opponent uses Vicious Offering to kill two of his saprolings. Then, casts Ancient Animus on his saproling and my 3/2. Saproling, being non-legendary, dies, dealing 1 damage to my guy.